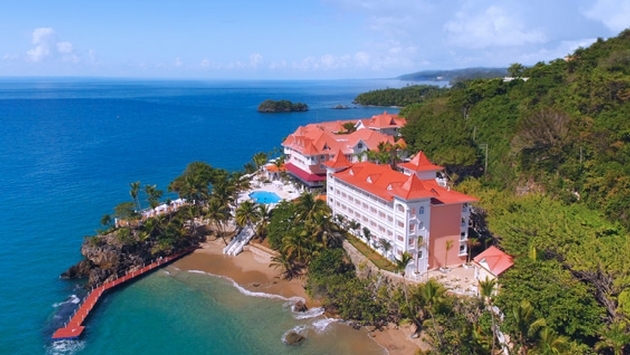 [PHOTO: The Bahia Principe Samana Hotel in the Dominican Republic will open its doors in November. One of the fastest-growing trends in the all-inclusive space is the continued expansion of the “adults-only” segment. Resort companies in the Caribbean are expanding the format with a series of new properties that focus on couples planning destination weddings, honeymooners, couples seeking some time together, as well as groups of singles traveling together. These new properties include several Dominican Republic resorts, including the Hotel Riu Republica, which debuted in June; the Viva Wyndham V Samana, which opened earlier this year; CHIC Punta Cana, which was unveiled in December 2014; and the Luxury Bahía Principe Samana Don Pablo Collection. The adults-only expansion is spreading to other Caribbean destinations as well. In January, Royalton Luxury Resorts will open the 455-room Royalton Negril and the 94-room Hideaway at Royalton, an adults-only boutique resort within the Royalton Negril, on Seven Mile Beach. AMResorts operates two adults-only properties in Jamaica: Secrets St. James Montego Bay and Secrets Wild Orchid Montego Bay. Meanwhile, the Bahamas’ Paradise Island resort district is poised to welcome its first new property since 2007, the adults-only all-Inclusive Warwick Hotel. These properties appeal to a wide range of travelers, including millennials, baby boomers and generation X vacationers. Virtually all are in search of sunshine, good times and a resort atmosphere that, while free of youngsters, is by no means bereft of the young-at-heart. Indeed, the growing roster of adults-only resorts targets a clientele that is in search of sophisticated fun in an upscale environment. The deluxe facilities, amenities and services that characterize these properties produce an environment that enables adults to enjoy diverse activities and simply relax among like-minded individuals. CHIC Punta Cana, for example, has worked toward creating a “social vacation” experience. The property’s contemporary architecture features a well-executed modern interpretation of a classic Las Vegas resort design with clean lines, open vistas and utilization of natural materials in public areas and across the smartly manicured grounds. Guests can relax in beachside cabanas or under thatched-roof shaded lounge chairs while enjoying butler service. Swimmers can create underwater social media images in the resort’s glass-walled aboveground Mermaid Pool. Beachfront yoga classes are held each morning on an amphitheater-styled stage that overlooks the property’s main pool. Similarly, the Riu Republica caters primarily to couples in search of surroundings that create a romantic, relaxing atmosphere. Guests enjoy premium liquor, free Wi-Fi throughout the resort, 24-hour concierge services, in-room robes and a special wine list. Concierges can arrange a variety of special experiences, including romantic dinners on the beach. Many of these properties also feature premium resort-within-a-resort sections. CHIC Punta Cana guests can upgrade to Diamond Club accommodations that feature such perks as butler service, access to exclusive pool and beach areas, preferential reservations for à la carte dining, suites featuring mini-bars offering premium spirits, early check-in and late check-out, access to the hydrotherapy spa and a private lounge serving breakfast, hors d’oeuvres and desserts. Caribbean resort-goers are famous for spending as much time on the beach as in their rooms (if not more), but the adults-only market has higher-than-average expectations when it comes to accommodations. The newest generation of adults-only properties take accommodations to a next level. At CHIC Punta Cana, for example, rooms are designed in a contemporary style with balconies, terraces and swim-up suites equipped with minibars. All rooms feature interactive digital televisions that offer complete guest account and resort information. Bathrooms are finished in marble and tile with overhead rain showers. Select suites feature two-person tubs equipped with massaging jets. Vacationers seeking a luxury villa-style experience can opt for CHIC Mansion, an 11,500-square-foot house featuring six guestrooms, each with a dedicated ensuite bathroom. The villa also features a private pool, hot tub, patio, sound system and games room with a pool table. Mansion stays include roundtrip airport transfers, butler service, a private pool cabana with an attendant and a complimentary spa treatment for each guest at the 5,246-square-foot Royal Spa. The Spa is one of the best of its kind with a hydrotherapy circuit and several treatment pools, each designed to provide a different temperature and sensation. Cuisine, of course, is one of the key elements of any vacation, and adults-only resort guests are especially discriminating in that they expect multiple dining options. The Riu Republica offers an array of specialized food facilities, including La Altagracia, which offers buffet-style international cuisine, and three à la carte restaurants: Kaori, which serves Asian fare; Tagliatella, an Italian eatery; and Quisqueya, a steak house. The resort also features five bars, one of which is open 24 hours a day. CHIC Punta Cana features several distinctive culinary offerings, including à la carte restaurants: Tagine (Moroccan fare), Pescari (ceviche and sushi), Hunter (a steakhouse), and Vespa (Italian). Guests will also find lighter fare at Munchies, a poolside snack bar and Insomnia, a coffee, dessert and ice cream shop.